Got the Winter Blues? Sad? Struggling with Addiction? Home Blog Awaken to Transformation Winter Blues? Sad? Struggling with Addiction? Struggling with Addiction this Winter? It’s dark in the morning and dark in the afternoon. The holidays are over and spring is way off in the far too-distant future. It’s cold. This is the season when depression sets in deep. As if compulsive drug use, drug addiction, drinking alcohol and alcoholism aren’t difficult enough, this time of year makes struggling with addiction extra unbearable. Winter blues (or seasonal affective disorder, SAD), pill taking, depression, alcoholic drinking and addiction often go hand in hand. This is also an especially trying time for anyone in recovery to be prone to relapse. Dark and cold days give way to long and icy nights. For anyone recovering or suffering from alcoholism or other addiction, this time of year is fraught with the temptation to try to escape with drugs and alcohol. If this sounds familiar to you, or a family member struggling with alcohol or drug addiction, instead of trying to escape with substance abuse, we’d like you to consider another type of get-away this winter. 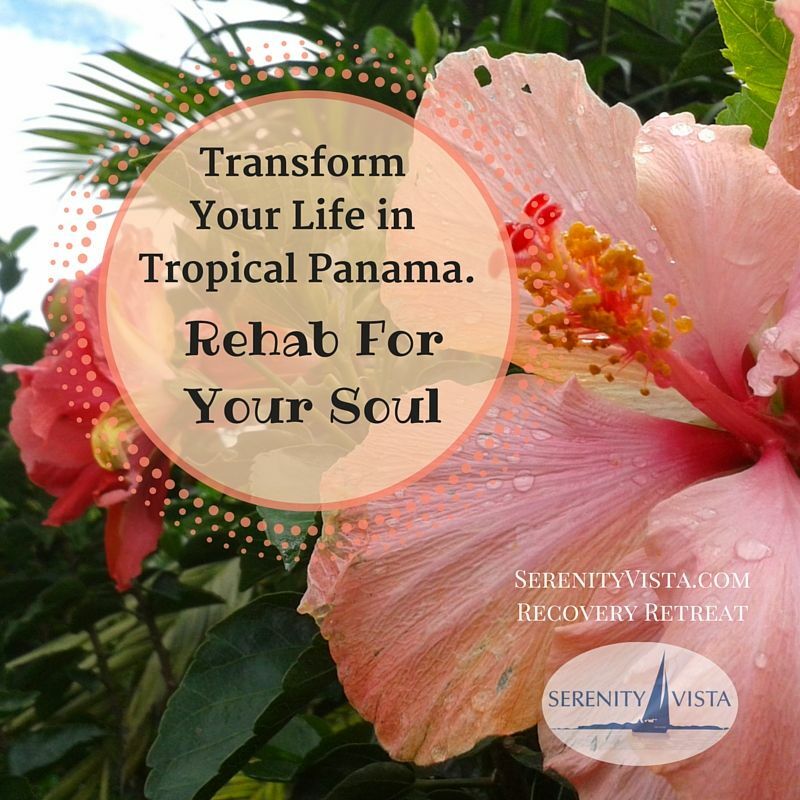 What better time than now to come stay at our world-class recovery retreat in tropical Panama where you can start your life anew? Instead of spending the rest of this winter feeling depressed, lonely, guilty, stressed, or frustrated with your life, or dependent on drugs or alcohol, we invite you to join us in paradise for our world class rehab retreat abroad. Our 90-day treatment program is optimal and guaranteed to transform your life. Rather than waking up to another hangover or head full of regrets, you could wake up to sunshine, tropical bird songs, the warm mist of waterfalls, and a compassionate, professional rehabilitation staff to guide you on your path to a new life of happiness, contentment, and sobriety. Serenity Vista is unlike conventional institutional and very expensive treatment facilities which are ubiquitous across the United States (US) and Canada. Our affordable program is a highly unique and effective whole life integrated retreat concept, with a proven track record of success. A place of sanctuary and self discovery, Serenity Vista incorporates art therapy, creativity, fellowship, and spiritual healing practices such as meditation and yoga. Far beyond the stark white walls and dull fluorescent bulbs of other treatment centers, we bring beauty and nature in as major and meaningful components for healing. Outdoor adventure and recreation are an integral part of holistic healing of the whole person. Hiking among tropical flowers, sailing on a pristine blue sea, and surrounded by lush greenery while walking, talking, and working with each guest individually, we offer a truly life-changing experience. Unlike other programs, ours is intimate. We accommodate no more than 6 guests at a time which allows for close, individualized care for each of our special guests. We know that stodgy lectures, cafeteria lines and conventional systems of control – hallmarks of traditional treatment centers – do not lead to lasting transformation. Instead, with more than 40 years of success in recovery and addiction therapy, our experiential healing philosophy is based on trust and mutual respect. People have the inherent capacity to heal when treated with dignity and respect. Addiction is about control; recovery is about freedom. ~ Serenity Vista Founding Director John Derry. Our experiential programs take a whole-person approach to help you achieve that freedom. We integrate 12-step recovery principals with holistic and purifying experiences for mind, body, and spirit. We focus on healing through relaxation, massage, and exercise in a beautiful natural environment. Because we’re holistic, we also emphasize the importance of diet when it comes to healing and sustained health. You will enjoy three amazing healthy meals daily using delicious choice ingredients, full of locally fresh tropical fruits! We can’t think of a better way for you to escape the winter blues and take your first meaningful steps away from the winter blues or addiction, toward transformation, sobriety, and full freedom. Get away from the cold of Canada, USA or Europe and the rest of the world to join us this winter at our privately-owned upscale addiction treatment center in beautiful Boquete Panama. More than a just a winter holiday. Beat the winter blues AND transform your life! Book your recovery now! 90 day treatment, addiction, affordable drug rehab, affordable rehab, alcohol or drug addiction, alcohol treatment, alcoholism, art therapy, best alcohol treatment, best private rehab, depression, drug rehab, drug relapse, get-away, hangover, holiday, holiday in panama, holistic rehab, individual rehab, john derry, private addiction treatment, private rehab, relapse, retreat, retreat in panama, sad, seasonal affective disorder, serenity vista, sober, sobriety, spiritual retreat, start new life, substance abuse, treatment for hangover, upscale, upscale rehab, winter blues, winter holiday, yoga. Bookmark.